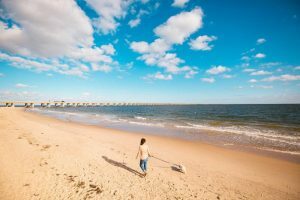 Autumn is a great time to visit dog friendly Virginia Beach. The crowds are gone but the beaches are as beautiful as ever. And best yet, in the off season your pooch is welcome to run and play off leash on the beach; just be sure to pick up after your pet. And if you don’t feel like getting sandy, you can stroll along the boardwalk, with your pet on leash. (FYI, during the summer season, dogs can be off leash on the north end of Virginia Beach above 42nd Street and the south end in the Sandbridge area before 10 a.m. and after 6 p.m. Dog promenade time on the boardwalk is limited to between 6 and 10 a.m.) Be sure to check Petswelcome for a whole host of pet friendly lodgings in Virginia Beach that will welcome you and your best friend. Off season is a great time to visit Virginia Beach; your canine is welcome to frolic in the sand on leash or off. Frolicking in the sand is fun but so is eating when you’re on vacation, and there is no shortage of dog friendly restaurants in Virginia Beach. 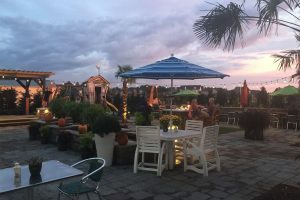 If you’re looking for a classic seafood experience, get a table on the deck at CP Shuckers, one of our favorite dog friendly restaurants in Virginia Beach. The menu also includes some twist on the seafood theme like Crab Mac & Cheese, Buffalo Shrimp, and Tuna Philly Sandwich (blackened tuna topped with provolone and peppers). Water bowls available upon request. In addition to offering 80 beers from around the world (including 42 on tap), Abbey Road has a Sensible Seafood program, meaning it serves only sustainable seafood. Sustainable and delicious, we hasten to add. Shrimp & Grits, Fried Oyster Sandwich, She Crab Soup, Lobster Mac & Cheese, Shrimp & Crab Leg Platter—yes, please! And if you are seafood weary or averse, there is plenty to pick from—prime rib, Jamaican Jerk Chicken, burgers, and more. Most cool of all, it’s open for breakfast, with Beatles’-themed offerings like Let It Be Brunch (scrambled eggs, steak, and fresh fruit) and The Yoko Ono (two eggs with toast, bacon, and hash browns). Enjoy it all on their covered dog friendly sidewalk patio. 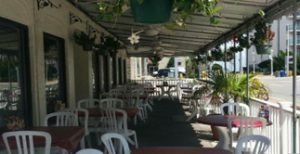 Abbey Road Pub & Restaurant in Virginia Beach has a spacious dog friendly sidewalk patio. 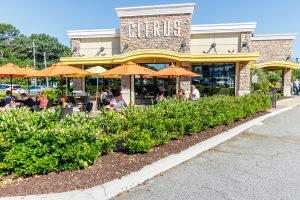 Looking for more dog friendly restaurants in Virginia Beach that serve breakfast? Citrus is a fantastic choice, open daily 7 a.m. to 3 p.m. French toast made from croissants or cinnamon raisin bread, pancakes your way (buttermilk, blueberry, citrus, banana, pumpkin, chocolate chip), Chesapeake-themed Benedicts to make you swoon (Jumbo Lump Crab, Shrimp & Crab, Softshell Crab, Smoked Salmon—well, that last one is more New York-y), and Country Fried Steak served with eggs and hash browns. And since it’s always brunch at Citrus, it’s always time for a mimosa, and they offer eleven different kinds. Sage Kitchen is another one of the dog friendly restaurants in Virginia Beach offering brunch as well as lunch and dinner. What we find most fun is that you can craft your own salads, choosing from a selection of greens, fruit, cheeses, nuts, and additions like quinoa crisp or onion frazzles. You also have the option of adding a protein—and what proteins they are—smoked turkey, wild boar patty, grilled Carolina shrimp, Chesapeake Bay crab cake, and more. You can also build your own burger or go for one of their deliciously creative sandwiches, like the Crab BLT or Brieberry (roast turkey, honey mayo, brie, and fresh strawberries). Finally, if you’re feeling in the mood for barbecue, get you and your pup over to Barbeque by Froggies on Shore Drive. Its menu is an eclectic mix of bbq, seafood, burgers, sandwiches, and tacos. If you’re feeling the need for smoke, you can choose from baby backs, brisket, chicken, or pulled pork—or go whole hog and get the Full Frog, with brisket, ribs, pulled pork, chicken, and fried catfish. It’s the South, so of course the sides are amazing but definitely try their Sweet Potato Hash, which includes lump crabmeat and bacon. They’ve also got awesome appetizers, like fried frog legs and hand rolled pork lumpier with sweet chili sauce. Froggies has a dog friendly deck and are happy to bring a water bowl on request. So stop feeling sad that summer is over! Instead, take an off season adventure and enjoy the beaches and dog friendly restaurants of Virginia Beach.